The classical dance is performed by the dancers as the highest form of worship. They dedicated themselves to Shiva, the dancing Nataraja and the supreme symbol of cosmic energy. There is also a myth that when Lord Shiva shook his hand drum, the world heard its first rhythm. As he moved his body with its beat, the universe came into being. Dance forms an intrinsic part of worship in the temples where the dancers offer the God the dance and music, being the most beautiful expression of the human spirit. The Indian classical dance subscribes to a rigorous code and depends upon the convenience of the body. But the origin of Indian dance has been lost in times. The four distinct classes of Indian Classical dances are Bharatnatyam, Kathak, Kathakali and Manipuri. In the recent years, there has been a major change in the classical dances of India. Various experiments have been done with the Indian dances to adapt them to modern ballets by great Indian and foreign artists. But, they have still remained close to their traditional classical form and do not generally attempt to portray contemporary themes. They are now performed in the various parts of India as well as in abroad, far from their places of their origin and attracts a large group of people. Some young people in the western countries have also started learning the techniques of Indian dances. Its excellent quality and rhythm have caught the imagination of the people. As in architecture, painting, languages and literature, signs of growth and synthesis are visible in the evolution of other aspects of culture. Governed by almost the same basic ideas, the music and dances of India developed a very rich variety on the foundations laid in the ancient times. The earliest traditions of Indian music can be traced bank to the Vedas which prescribed the pitch and accent for the chanting of Vedic hymns. The music of the Vedic chant survives to this day. The earliest known treatise of Indian music, dance and drama is as old as second century B.C. this is Bharata’s Natyashastra. Much of the musical terminology used till today is derived work composed over a thousand years later was Matanga’s Brihaddesi. The concept of raga was discussed at great length in this work. A thirteenth century work, Sangadeva’s Sangita-ratnakara, mentions 264 ragas. Indian music, both vocal and instrumental, developed with seven basic wind and drum instruments were later invented. Music has, from times immemorial, been one of the cherished arts of musicians, many rulers themselves were accomplished musician. We see, for example, Samudragupta’s coin in which the king himself is shown playing on the Vina. Music was also associated with the worship of gods and goddesses and in its perfection it has received the same devotion as worship. The medieval period witnessed further developments in music. Music was not a part of the original Islamic tradition (though the form of recitation of the Quranic verses is musical), but it developed under the influence of the Sufis and became a part of court life. Many new forms and instruments were developed. Amir Khusrau, about whose contribution to literature and historical was enormous, is believed to have invented some of these musical instruments. He was the originator in India of the early form of the popular musical style known as Qawwali. Khayal, one of the most important forms of Indian classical music, is also believed to be his contributions. Then there are the legendary figures of Baz Bahadur, the ruler of Malwa, and his queen Rupamati in the sixteenth century. They were not only accomplished musicians but also introduced many new ragas. The most notable figure in music in medieval India was Tansen, the court musician of Akbar. His attainments in music have become a legend and his memory is deeply cherished by every musician to this day. The patronage of music continued at the courts of rulers in the eighteenth century and the traditions evolved through the centuries were kept alive. The contribution of the Bhakti and Sufi saints in the development and promotion of music is very important. The growth of Indian classical music has been a major force of India’s cultural unity. For hundreds of years, most of the words and themes of the Indian classical music have been derived from Hindu mythology but some of the greatest masters of this music have been Muslims. It is interesting to mention here the Kitab-i-Nauras, a collections of songs in praise of Hindu deities and Muslim saints, which was written by a seventeenth century ruler Ibrahim Adil Shah 2nd. Both in vocal and instrumental music, two main classical styles have evolved Hindustani and Carnatic. Some of the greatest figures in Carnatic music were Purandaradasa, Thyagaraja, Muthuswami Dikshitar and Syamasastri whose compositions continue to dominate Carnatic music even now. These two styles have many things in common and each has a variety of forms. The rich heritage of classical music that has come down to us has been further enriched in the hands of masters in India today and has won admirers all over world. Besides classical music, Indian people have developed rich traditions of folk music. Indian dance has also developed a rich classical tradition. It has become the medium of expression of emotions, of telling a story and of drama. The story of Indian dance can be seen in the temple sculptures of ancient and medieval times. The popular image of Shiva in the form of Nataraja symbolizes the influence this art form on the life of the Indian people. It received the patronage of emperors and kings as also of the common people. Some styles of classical dance that have evolved through the centuries are Kathakali, Kuchipudi, Bharat Natyam, Kathak and Manipuri. All these styles have developed over a long period of time. Practically every region and area in the country has also developed rich traditions of folk dances. The rich variety in music and dance forms, classical and folk, is a major component of India’s cultural heritage. Through their music and dance, Indian people have expressed their joys and sorrows, their struggles and aspirations, and a myriad other emotions. While at work and during their hours of leisure, they have danced, sung and played music. These art forms have been inspired by life and in turn have enriched life. Here only a few components and aspects of India’s cultural development have been described. Indians throughout their history made significant advances in various fields of knowledge such as science and mathematics, medicine and surgery, and philosophy. Some of the great names in Indian science, mathematics, medicine and surgery are Aryabhata, Brahmagupta, Charaka and Sushruta. A prominent figure in the field of science in the sixteenth century was Fathullah Shirazi. In all these fields, India’s achievement reached other countries. Many works of these men of science were translated by the Arabs and through the Arabs they reached the Europeans. The world is already familiar with the story of the Indian numerals. Indians also benefited from the scientific achievements of other cultures, particularly in astronomy and, in medieval times, also in medicine. Science in India failed to keep pace with scientific development in some other parts of the world only from about the sixteenth century when modern science began to develop in Europe. In technology, this situation came even later. The comparative backwardness of Indian science and technology grew more acute as science and technology made rapid progress in the West. This has had disastrous consequences. In philosophy also, India made significant advances in ancient and medieval times. Many distinct schools of philosophy grew, both idealist and materialist. In later times, however, there was too much emphasis on writing commentaries on earlier philosophical works rather than developing new thinking. Though India’s heritage in this area of intellectual life is of great importance and has been a significant influence in philosophical writings in other countries, the neglect of certain developments in philosophy had a negative effect on Indian intellectual life. These developments, particularly of scientific, humanistic and rationalist thinking, began to be imbibed in Indian intellectual life in the nineteenth century. Through the long years, people living in India and those coming to India intermingled with each other. They developed a rich and dynamic culture always ever-growing through its internal evolution and through contacts with other cultures. Many streams of thought, belief and expression originating else where have mixed with the ever-growing streams in India and coalesced to form the ocean of Indian culture. Many streams of faith and religion, of styles of architecture and art, and of languages rich in literature have developed during the course of centuries. In its variety Indian culture is one of the richest in the world. All the diverse streams have developed in this country and are Indian. This richness has come about as a result of the freedom which every region and community has enjoyed to develop its genius and through their mutual interactions. It also needs to be remembered that the culture of any country is a dynamic and ever-growing entity which needs to be further developed and enriched by every generation. This in brief is the story of Indian cultural development through the ages. Our Guide and Tour escorts of Indo Vacations would be glad to tell you more about the Heritage of India. In Indian dance, the Rasas or the aesthetic mood holds the central place. There are Nine rasas in the Indian Dances which are the Shringara Rasa or love, devotion, humour, pathos, heroism, fury, terror, disgust, wonder and peace. These dances of India are performed for more than 3,000 years. The various themes of the dances are the myth, legend and ancient literature with which it has been associated through its long history. The Natya Shashtra, India’s canonical treaty on dramaturgy was written in the 3rd century B.C. This Shastra is generally recognized as the most authoritative work on the subject. According to the Indian history, dance is a part of drama and the classical dancer is like a storyteller. For this purpose, the dancers use the hand gesture. A hastamudra or the hand gesture is used to convey a wide range of meanings like pearl, fragrance, a drop of water, silence, salvation, generosity, testing medicine, and calling the beloved. There are various mudras and there are various possibilities of expression through the different combinations. In the dance there is use of intricate patterns of rhythm which is evident in the footwork and is also emphasized by the jingling ankle-bells. Bharatnatyam is one of the oldest form of the Indian classical dance. The word "Bharatnatyam" is composed of four words, Bha, Ra, Ta and Natyam. "Bha" means Bhava or emotional projection, "Ra" means Raga or melody, "Ta" means Tala or rhythm and "Natyam" means the art of dance. This dance technique was originally performed by the Devadasis or temple dancers in the temples of South India, Andhra Pradesh and Karnataka. In this dance, there is a dancer, who represents various characters in the story and the theme on the music. The themes of the Bharatnatyam dance are lyrical, and there is also great scope for the drama. The rhythmic patterns of this dance are beautiful and accompanied by the corresponding beats on the Mridangam, a long drum which tapers at both ends. The principal singer is also the director of the dancers. 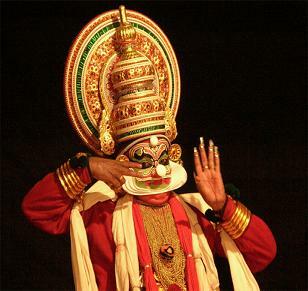 Kathakali, originally known as Ramaktham, the story of Rama, is a dance drama of Kerala. Its themes are taken from the ancient epics and is based on drama. The hand gestures and minute facial expressions are used to portray situation and emotion. The performance opens with passionate drumming that takes the spectator to another world of Gods and Goddesses and various Hindu myths and legends. The towering head dress, detailed facial make-up, dim lights and accurate gestures create a natural illusion. This dance can be performed for the life long and only by the men. The Kathakali dancer can perform his dance without any stage or scenery, and can call convincing images of forests, oceans and palaces. The music and orchestra forms an integral part of the Kathakali dance and are of a very high order and excellence. Kathakali plays are written in the Malayalam language and based on the mythology and the themes of Ramayana and Mahabharata and set to music in appropriate Ragas. The Manipuris have woven the song and dance into their life and also considered themselves as the descendants of the Gandharvas. The Manipuri dance is lyrical in character and its movements are very graceful and delicate. The Manipuri style of dance reminds one of the medieval sculpture of India, with more emphasis on curves and circles. In recent times, many choreographers have adopted the techniques of Manipuri to modern ballets based on contemporary themes. The costumes of Manipuri dancers are very pretty and colourful and add a very cheerful note to India’s dance heritage. The various legendary and mythological tales like the Rasa Lila, Dance of Shiva and Parvati and Lai Haraoba of Khamba and Thoibi are performed in this dance. Kathaks were originally the storytellers who used dance to illustrate the 'Kathas' or stories. These dances were originally performed in the temples of North India, But as a result of Mughal rule in the 16th to 17th centuries, they went from the temple to the courts and have grown directly out of the ancient tradition of Indian dances. The Kathak dance has an elegance and sophistication that indicates the urban society in which it flourished. In this dance, the dancer’s feet take up the challenge of the drums. Light footwork and ankle bells are accompanied by the beats on the table (drum) and the dancer brings out the most intricate patterns in the perfect time and rhythm. To the dancers it is the most natural medium of self-expression. There are two schools or Gharana of the the Kathak dance, which are the Jaipur Gharana, that focus on the Layakari or rhythmic wizardry and the Lucknow Gharana that focus on the Bhava or moods and emotions. Kuchipudi derives its name from the Krishna district of Andhra Pradesh. This dance form ,which originated in South India, was the result of the Bhakti Movement in the 6th Century. In the 17th Century, Siddendra Yogi, the originator of the form, presented a dance-drama with boys from the village of Kuchipudi. Consciously, the performers raised the form above the reach of the Devadasis. The boys were committed to an annual presentation of the form and passed on the techniques to the next generation. So, a tradition and a form were born. In Kuchipudi, the performer needs to express speech and song through his dance and gestures. The Kuchipudi dancer, apart from being a dancer and an actor, should have a high proficiency in languages like sanskrit and telugu, music, and the texts of performance. Kuchipudi plays are also generally performed in the open air on improvised stages during night. The sutradhar, plays an integral role in introducing the characters, providing humour and bringing together the performance. The fast paced nature of Kuchipudi has made it a popular dramatic-dance form. Presently, it is better known as a solo dance form, with experimental choreography much in demand. The folk dances of India are very old, but the prestige associated with them is new. Now, these dances form the most colourful part of India’s Republic Day parade. These dances have now travelled from rural to urban areas. The dancers from the Himalayan regions sway and bend and thus recreate the vast and undulating ranges of the Himalayas. The agitated movements and abrupt changes of posture with the rhythms in the folk dances of Assam signify violent storms and the uprooting of trees. The tense and watchful attitudes in the dances of the Nagas and the Gonds tribes denote the perils of the jungle. The dances of the fishermen of Bombay suggest the roaring, mounting waves of the sea. The folk dances of the people in North India impart a sense of peace and harmony.